To be the best. Simply put, that is the goal of Montbleau & Associates Inc., the San Diego, CA-based architectural woodworking company - and two-time WOOD 100 participant - which has consistently achieved double-digit growth on its way to earning $15 million in revenues in 2005. And it doesn't appear as though the successful growth trend will be slowing anytime soon. Already, Ron Montbleau, company president, CEO and CFO, is projecting sales of $18 million for 2006, and $20 million in 2007. "You need a good foundation for a company to increase 20 percent each year. It takes a lot of effort from a skilled and seasoned team, which we have," Montbleau says. In addition to David Zammit, vice president "and overall project manager and production manager" who has been with the company for 25 years, the core team has been with Montbleau for 10 to 15 years, with the remainder of the employees averaging five to eight years. That level of experience has enabled Montbleau & Associates to earn a reputation for quality and quick turnaround. "The way this business works is that it's all built on relationships. [The architects and builders] know we can go in and perform - and meet their schedule," he adds. 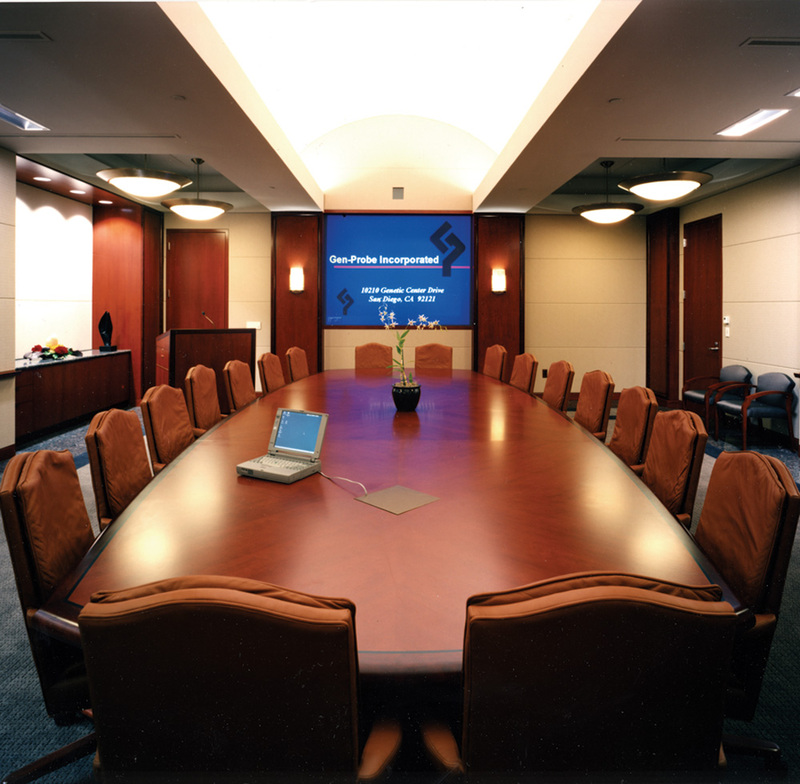 Montbleau & Associates specializes in manufacturing wood and laminate casework and architectural millwork for commercial applications, primarily corporate offices and boardrooms, hospitals and hotels. The company's projects typically range in price from $250,000 to $3 million. And while the company's current client base is located in Southern California and the San Francisco Bay area, that may soon change. According to Montbleau, the company is looking to parlay its hotel experience and cash in on the casino market. "Clients doing hotels are often the same ones doing casinos," he says. "We have been in the business for 26 years and have developed the relationships. We also offer [our clients] complete services," Montbleau adds. As part of the company's customer relations, clients receive: pre-construction, estimating, project management, engineering, manufacturing, finishing and installation services. "We provide a value-added service to architects," Montbleau says. By providing this extra attention, he adds, it enables the company to "put our two cents in" during the planning portion of a project, thus ensuring the design is practical, value engineered, cost-effective and compliant with any government regulations. "We're educating the client to look at the entire scope of the project," says Bill Oberschulte, chief estimator. As part of its customer service, Montbleau & Associates also will assist in the material selection. Customers can visit one of the two veneer sample rooms Montbleau & Associates has on site. In addition, the company is certified by the Forest Stewardship Council for its use of "green" materials and is experienced in working on LEED (Leadership in Energy and Environmental Design) projects. "At this time, approximately 10 percent of our customers have LEED requirements," Oberschulte says. Those applications tend to be institutional projects, he adds. Once all the details are in place, an estimate is developed, which includes an in-depth breakdown of the scope of the work. "Bill's estimates are often so complete, they become templates' for the job," Montbleau says of Oberschulte's work. Following approval of the estimate, project engineers work with architects to develop working drawings, including floor plans, elevations, cross sections and other construction details. "We do our drawings in AutoCAD 2000," says Bob Geyer, head of engineering. "The program links to Microvellum software, which then uses the information to generate cutlists and programs for the CNC machines," he adds. "Our forte is our ability to understand a project, estimate it, engineer it and manage it," Montbleau says. "Our ability to manufacture is also very strong." 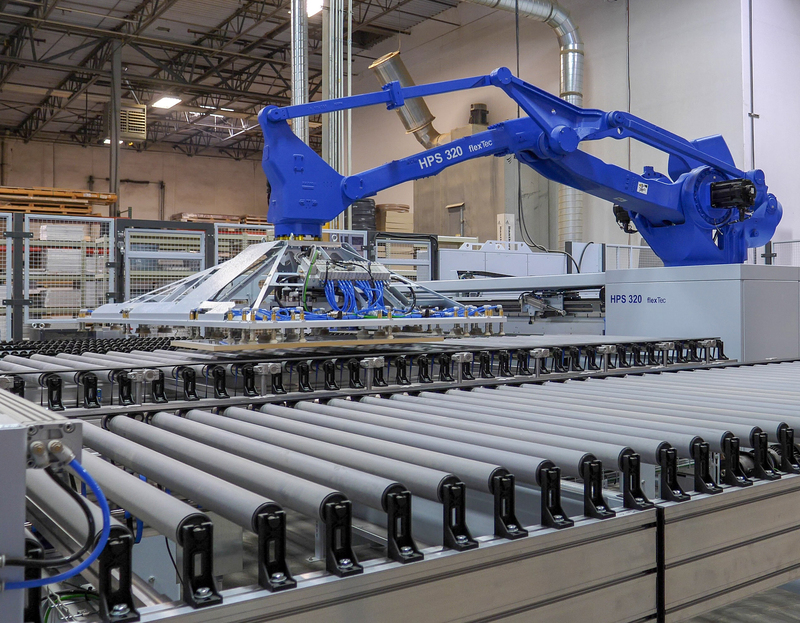 The company is renown in California for its ability to produce fast-track projects, while manufacturing on a just-in-time basis, says Victor Verdugo, plant manager. "Our machinery is set up to do repetition, but we can do any size job requested," he says. There are typically five to 10 jobs on the shop floor at any given time, Verdugo says. To help ensure projects remain on schedule, the company invested approximately $2 million in computerized equipment over the last few years. Flat panels are cut to size on a customized Giben CNC rear-loading panel saw, which is also equipped with kerfing capabilities. Information is downloaded from the office to the panel saw, which then produces bar code labels for subsequent machining operations and for tracking the progress of the parts. From the panel saw, parts are transferred to one of two Morbidelli Author CNC machining centers. The newer Morbidelli Author 600 is equipped with a 10-position rapid tool changer and is used for larger-sized jobs. The company also has an older Morbidelli Author 504 for smaller jobs. An IMA single-sided edgebander is used to apply wood or PVC bandings onto panel edges. The company also has a SCMI Basic 2 edgebander on hand for specialty jobs. In another area, on the shop floor, simultaneous drilling, gluing and dowel insertion is performed on a Gannomat Elite 25, which features a 25-spindle horizontal boring unit, a 25-spindle vertical boring unit and six dowel inserting units. Prior to finishing, flat components and veneered panels are sanded on a DMC widebelt sander. The DMC has two head units and a platen for sanding solid wood and veneer. "The DMC has eliminated a lot of the hand sanding previously required before finishing," Verdugo says. All wood and veneered casework and paneling is finished on-site to ensure consistency in color matching with the rest of the project. This includes those products Montbleau & Associates outsources from other vendors, such as drawers, standard mouldings and veneered panels. "We put a furniture-quality finish on all our parts. It's what helps distinguish us," says Ivan Proia, finishing manager. "We have started to make the switch to water-based finishes," Proia says of the company's spray material usage. Currently, Proia says, 30 to 40 percent of the sprayed finishes are water-based materials, with the remainder being catalyzed urethane. Adjacent to the spray booth area, UV and acrylic finishes are applied to flat panels, which are run through a Dubois UV flatline finishing system nearly 50 feet in length. The company installed the line approximately six years ago in an effort to improve its finishing efficiency. "The UV line is very efficient," Proia says. "The excess material is recycled, so there is no waste." 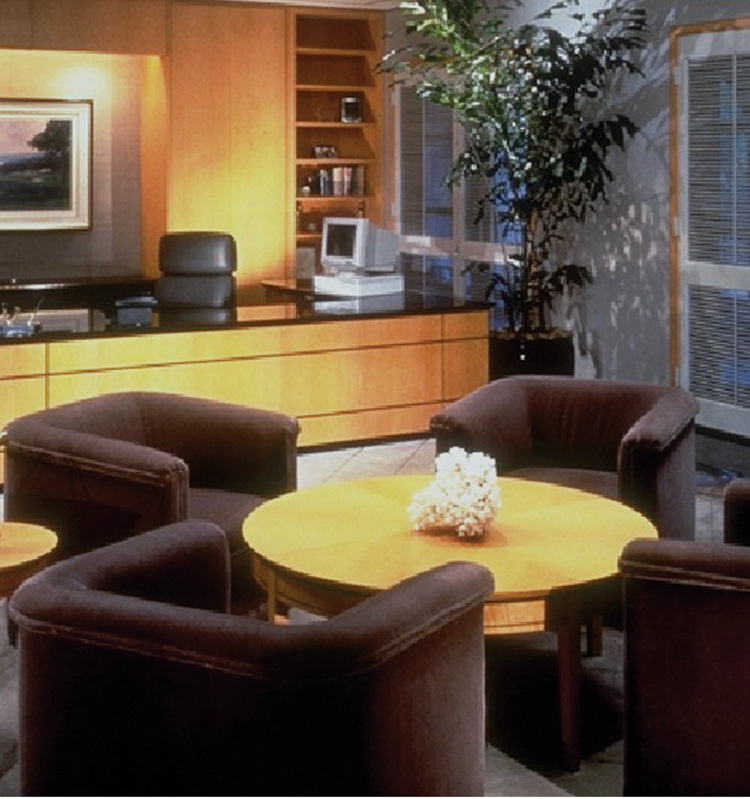 Montbleau & Associates Inc. has come a long way since 1979, when custom furniture maker Ron Montbleau arrived in San Diego, CA, to craft custom interiors for area yacht owners. As his relationships with the yacht owners developed, he began doing custom work on their residences. 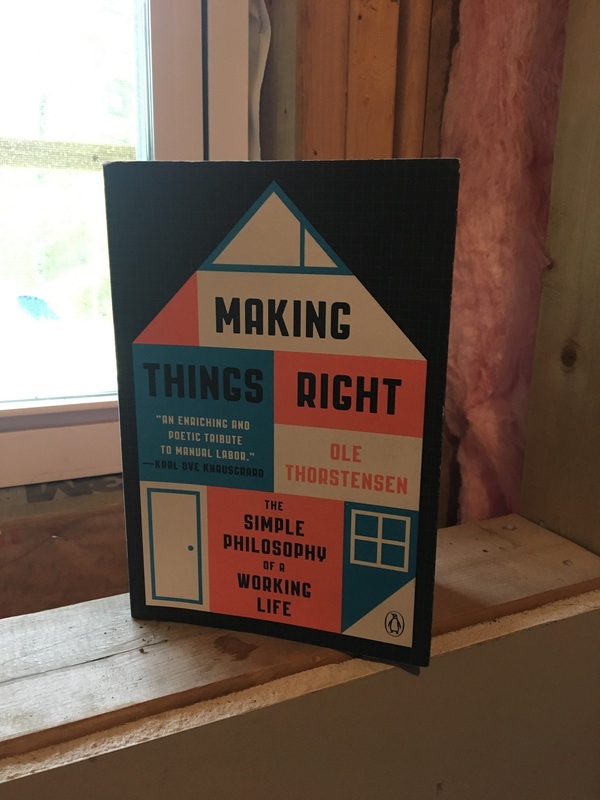 "After 10 years, I looked around to see where else people were doing fine woodworking, and that led me to move into doing corporate boardrooms, conference tables, reception areas - the whole office interior," he says. Today, 98 percent of the company's work is for commercial applications, including: law firms, banks, hotels, software corporations, investment brokers, laboratories and schools. The company works directly with architects for complete project management services. Corporate and manufacturing is in a 36,000-square-foot facility near the San Diego airport; a 4,000-square-foot addition is planned for early this year. The company currently employs 100 people. Montbleau credits his employees for the success of the multi-million dollar company. In addition to David Zammit, vice president, who has been with the company for 25 years, other core team members have been with Montbleau for 10 to 15 years, with the remaining employees averaging five to eight years. Montbleau attributes the low employee turnover to the company's stringent screening process, which involves background checks, drug tests and physical checkups. "I want to make sure that the person we're bringing in has a high chance of succeeding at the job. Our people here are not a commodity - they are the company." According to Montbleau, in order for the company to continue at its high level of efficiency and profitability, it may require additional outsourcing of components rather than machining in-house. "For me to grow the business, it will have to be through outsourcing," Montbleau says. "Our ability to manufacture is strong, but it is becoming less cost-effective because of the workman's comp and regulatory climate in California." Already he has faced pressure from a Chinese company trying to compete for some of Montbleau & Associates' larger, repetitive jobs. "That company is not under the same economic pressure that companies from California are facing [for regulatory compliance]," he says. "Our focus is on the added value - how to solve problems for our clients while offering the best value in terms of price, service, quality and schedule. We may not necessarily be the lowest bidder, but we'll give the best value," Montbleau says. "We're constantly looking at ways to facilitate the success of the team' ... then, we all win." 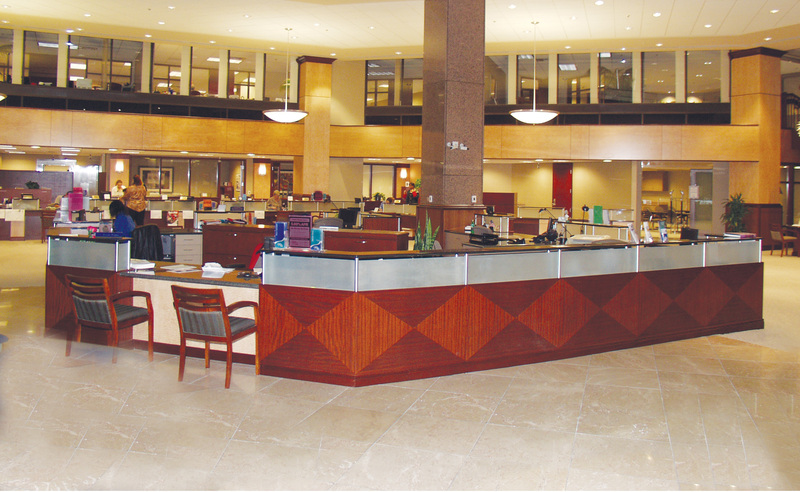 Montbleau & Associates Inc. specializes in architectural woodwork and casework for commercial applications. Established in 1979, the company employs approximately 100 people in the 36,000-square-foot plant; a 4,000-square-foot addition is planned for 2006. Montbleau & Associates is projecting 2006 sales of $18 million, an increase of 20 percent over 2005 figures. 1. The company's aggressive growth strategy relies heavily on its value-engineering capabilities and its high level of customer service. 2. In addition to outsourcing components, Montbleau & Associates uses CNC panel processing equipment to help meet tight deadlines for projects. 3. 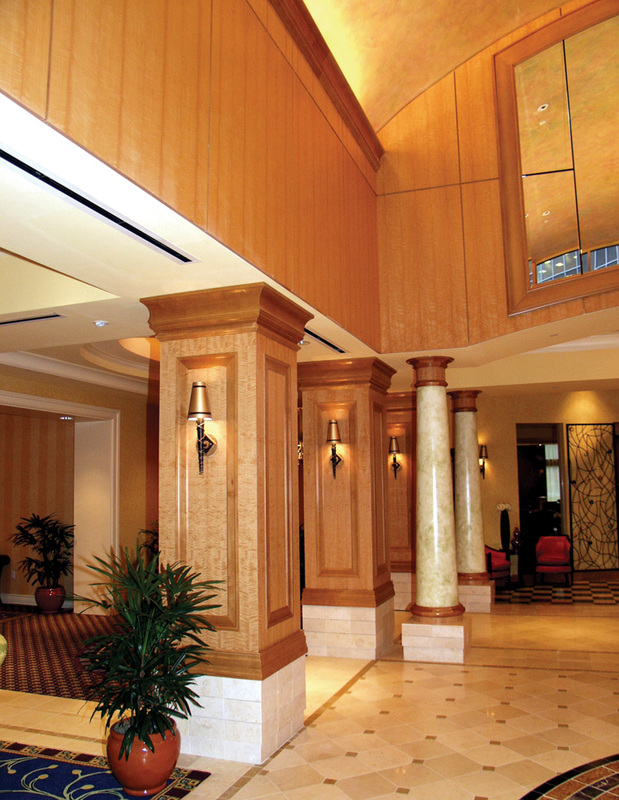 Montbleau & Associates was the first Southern California millwork fabricator certified by the Forest Stewardship Council. The company has also worked on LEED projects using certified wood from managed forests.